We live in San Diego and so our road trip started there, but frankly, the drive between San Diego and our first stop, Mammoth Lakes, is not �attractive� enough for me to entice you to commence your journey in our home town. It�s a 6 ½ hour drive with nothing spectacular to break it up. If you�re uncommitted to the starting point for this road trip because you�re flying into the area, I�d heartily suggest starting your trip by taking a connecting flight from San Diego or Los Angeles to Mammoth, cutting short your drive to the starting point of a spectacular part of the country. I think most people associate Mammoth Lakes with skiing, and this is understandable. 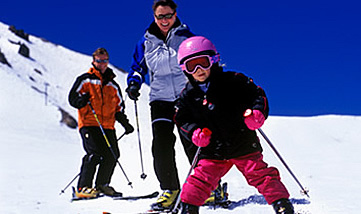 With over 3,500 skiable acres and a descent from 11,053 feet, the skiing in this area is hard to compete with in California, but having visited in the summer, it was apparent to me that Mammoth Lakes is also a fantastic destination for families in the summer. We only stayed one night, constrained by our two week limitation from start to finish, and our short exposure to this lovely spot made us hunger for more. 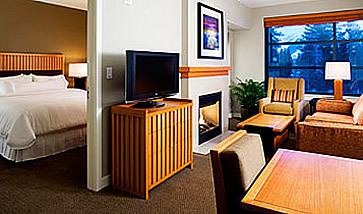 It must be said that Mammoth Lakes, is a rustic, mountain destination and that we stayed at the Westin Monache Resort, the only resort in the area that could be characterized as luxurious. There is no other hotel in the area that rises to the level of this particular establishment. It is just steps from the hub of The Village, alive with restaurants, boutique shops, and nightlife. 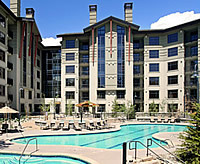 The pool and Jacuzzi area is surrounded by majestic Sequoias in the foreground and towering peaks in the distance. Staff is friendly and attentive. The 1-bedroom suites are lovely and feature a separate bedroom, living room and kitchenette, gas fireplace and private patio to enjoy the breath-taking views of the Eastern Sierra�s. The Whitebark Restaurant is inviting, as is the bar area, and is a place where locals congregate as well, adding a hometown feeling to your vacation. 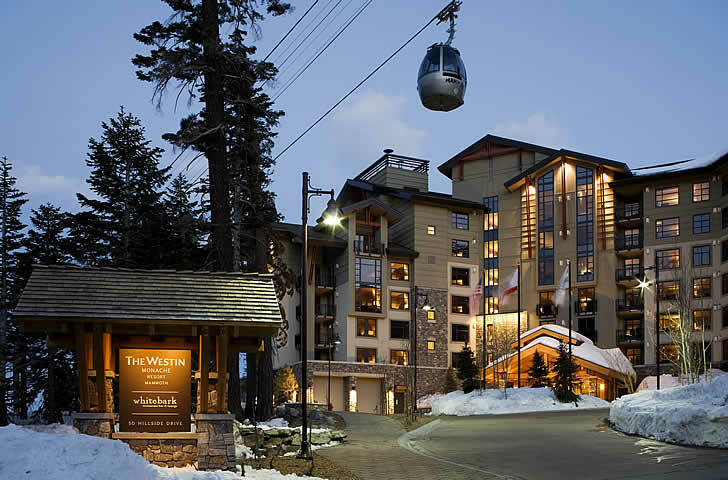 The hotel is situated ten steps from the transit gondola, a boon in the winter as it gives the property �ski-in; ski out� status. In winter, they have a ski valet that meets you at the bottom of the transit gondola, takes your skis from you and puts them in your very own locker. When you�re ready to ski the next morning, call down, and your skis will be ready for you in the same manner that you might call down to have your car brought out front. If you�re coming without skis, forget the lines at the rental office, a ski and snowboard valet will come to your room, fit you for boots and skis, put them in your locker and come back with the locker key. The hotel is dog friendly, so no need to leave your well-behaved pooch at home (he�s a member of the family, after all). Hotel staff will give you a dog bowl, dog bed, and homemade treats. Dog-sitters are also available at an extra cost (yes, babysitters are available too). There�s also a free Kids� Club every evening from 4-9 pm for kids between the ages of 4 and 12 where they enjoy arts and crafts, videos, and games while parents enjoy Whitebark Restaurant. 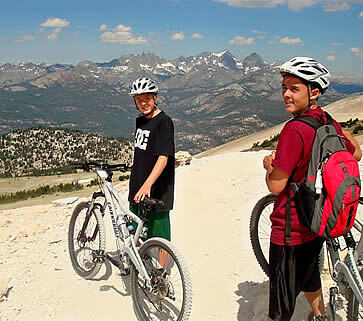 If you�re wondering how we utilized Mammoth Mountain to our benefit, we rented mountain bikes (rather than skis!) and although there is not �mountain bike valet� so to speak, we didn�t need one. The hotel provides a 15% discount for bike rentals at the Mountain Center, right across the street. We waited for the shuttle bus (right outside the Mountain Center), and after loading our bikes on the trailer-toting bus, we were on our way to the gondola where attendants put our bikes aboard for our ascent up the mountain. 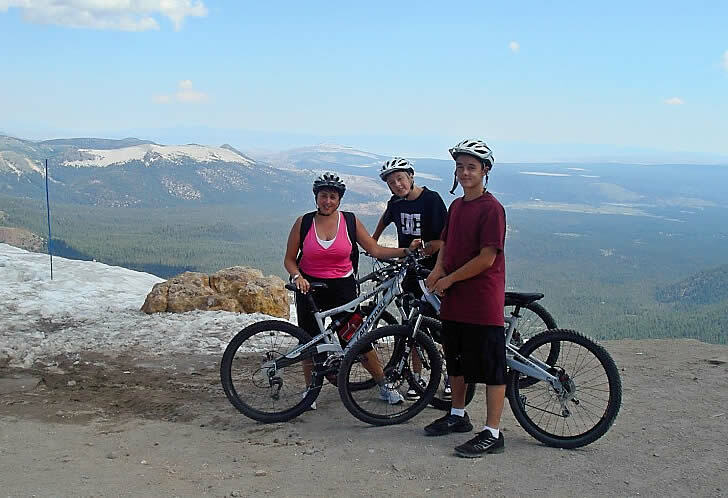 I have to say that despite the spectacular view of the surrounding Sierra Nevada Mountains, lakes, and towns, I had time to ponder on the ride up the mountain, ascending from 8,100 to 11,053 feet, the prudence of my decision to embark upon this ride. The descent was described to me as dirt trails through the trees, over roots, and skidding around sandy corners; I wasn�t so much concerned for the safety of my kids, as I was for how my 40-something body would sustain the trip. The actual descent, however, was totally �doable� and the sorest part of my body, truth be told, was the body-part doing the least work � my derri�re. The biggest hazard of this trip (for kids over 12) is prudence (going slow enough to be in control) and paying attention to the trail and not the view (not as easy to accomplish as you might imagine).